Take advantage of all the benefits that our CCH-certified Mercure Eschborn Ost hotel has to offer to make your events a success. The 11 air-conditioned meeting rooms boast state-of-the-art technology and free WIFI access, and have a maximum capacity of 220 people. They are suitable for both business and private events. Our T.E.A.M. concept means we can cater for your individual requirements and offer a welcoming atmosphere and expert advice before and during your event. Do you have any questions or specific requirements? Our qualified staff will happily offer you professional support, from the planning and organization of your event to assistance on the day. Our rooms are all equipped with a work space for notebooks and documents. Two children up to the age of 16 stay in their room for free. For your family stay, we recommend our family rooms for 4.our pet is welcome to stay with us (charge of EUR 10/night). Our Standard Rooms are ideally suited to your needs: In addition to a TV and telephone, they are equipped with a high-quality bed, comfortable seating and a functional desk space with free WIFI, as well as air conditioning, safe, minibar and hairdryer. Privilege room by the garden with skyline view. For more comfort: VIP bathroom amenities including bathrobe, snacks & drinks from the minibar, coffee/tea and free daily newspaper in the room. Also included: Wi-Fi and late check-out. Our Standard Rooms - equipped with two high-quality single beds, TV and telephone, comfortable seating, a functional desk space with free WIFI, as well as air conditioning, safe, mini-bar and hair dryer. Our deluxe rooms provide a restful night's sleep on the hotel's upper floors. VIP bathroom amenities include bathrobe, snacks & drinks from the minibar, coffee/tea, newspaper, WIFI and late check-out. Our family rooms with double bed and sofa are ideal for families or for short trips with friends. Functional workspace with free WIFI and air conditioning, TV, phone, safe, minibar and hair dryer. I stay here frequently and will continue to do so. Everything was good, fool people and facilities. ..except the inconvenience of the laundry room. I was greatly impressed with the staff helping me with my Accor account (I am a frequent guest at your hotels) and retroactively registering my last several visits to take advantage of the points. I found that level of service above and beyond my expectations. Thank you! Staff service was very polite and warm, nice new bathroom but rooms looking old fashioned and bed is too hard. The restaurant menu i was surprised to see has not changed at all since the Summer, and the choice not great. As a lot of business people stay here very surprising. Reception staff were so friendly and helpful. The rooms are good size for a family , clean and modern. The only thing we found a little annoying and unnecessary was that when we went to the restaurant at 9pm to eat we were made to eat in the bar which wasn't very nice as we had 6 children with us. we asked to eat in the restaurant as it was open until 11 but were told No by the man in charge at the bar as they had made it up for breakfast. it didn't make sense has the entire restaurant was empty and we were cramped in the bar area eating . The hotel itself is OK though it could benefit from a slight rejuvenation. It's on the service side that it would benefit from a drastic change. At check in I did not feel welcome though I had checked in online. The Restaurant experience on the first night was dreadful in regards to service. Not kind and far from respectful only one of the servers was very kind. On the second night the service was better but still not on the level you would expect in a Mercure. Dear Guest, Thank you for taking the time to tell us about your experience at the Mercure Hotel Frankfurt Eschborn Ost. I am sorry that your experience did not meet your expectations; please allow me to express my sincerest apologies. At Mercure, we strive to provide a superior service experience for every customer; therefore your feedback is very important to us. Please rest assured that we are taking the appropriate measures to address the problem and prevent future occurrence. We appreciate your sharing your concerns, and it is our hope that you will give us the opportunity to better serve you in the near future. 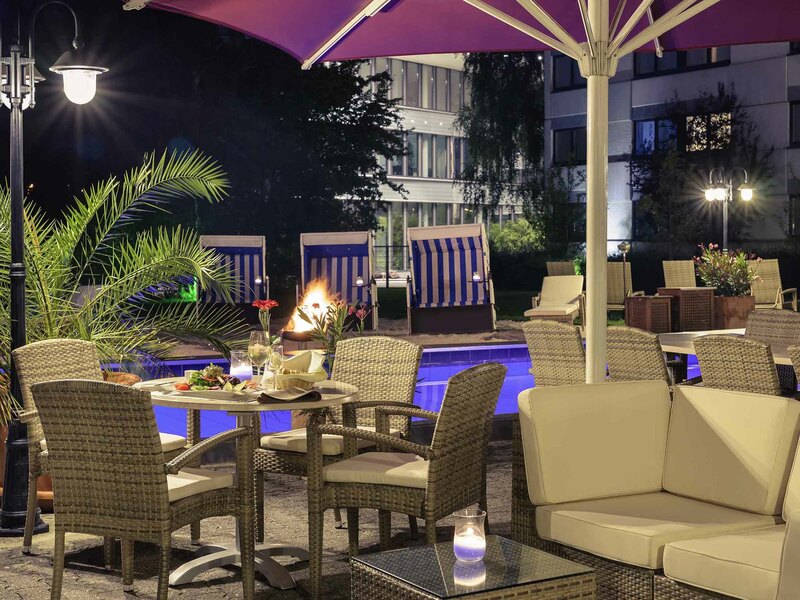 Sincerely Your Mercure Hotel Frankfurt Eschborn Ost. Friendly staff. Pillows way to soft even though I asked for hard pillows. Little disappointed that room wasn't offering free water in a bottle. If you have a car and don't mind being a bit outside the city, the Mercure Hotel in Eschborn Ost is a solid choice. Friendly and helpful staff at reception, fairly large rooms (if traveling as 1 or 2 persons), very clean, and a nice breakfast in the morning (fresh eggs and crispy bacon!) I would stay there again if my planning finds me in the area. Wonderful staff who make the experience so much more satisfying. Staying at this hotel is something I look forward to every time I am in Germany. This hotel lives because of its great staff everywhere. Be it at the reception desk, the restaurant or the floor, everywhere you find smiling people willing to help out immediately. The room was clean and well equipped, the breakfast and dinner at the restaurant just amazing. Only the location is a bit off but the hotel does its best to cover that with free shuttle options and cycle rental. The only good things were the staff and the food (breakfast and ala carte). The room was horrible! Smelling not fresh and dusty. The bathroom was even worse, smelling like pee and the bathub was not properly clean. The cushions are all flat and smelly. I have addressed the feedback when doing the check out, but got no positive response. Nor offer to anything. I don't want to stay there anymore. Very much disappointed. My worst mercure stay ever. The heather did not work in room 200. The room was very cold.